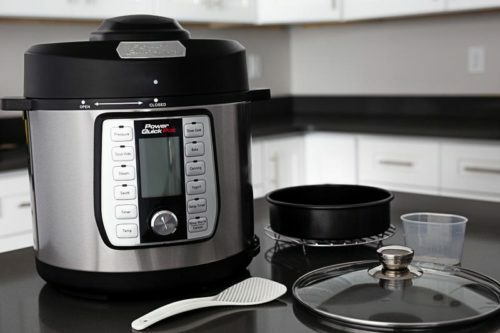 The Power Quick Pot is one of the newest electric pressure cookers on the market. 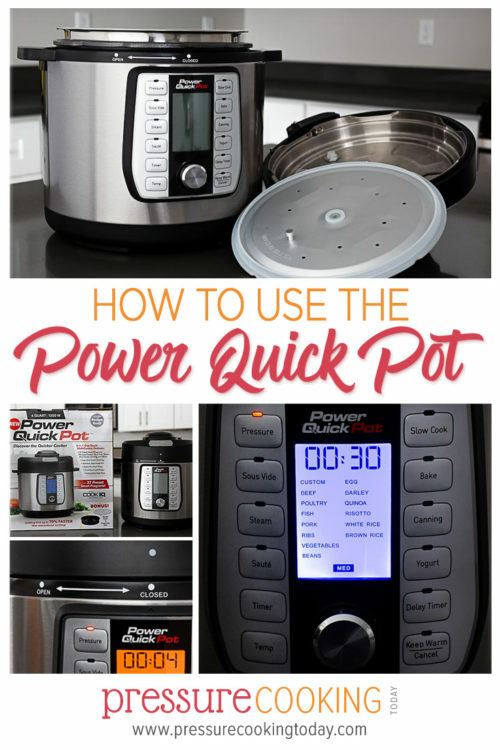 Here’s everything you need to know about how to use the Power Quick Pot. Lately Barbara and I have been getting questions about the Power Quick Pot, so we decided to buy a 6-quart to test out. The Power Quick Pot is higher quality pressure cooker by Tristar, an as-seen-on-TV brand that also makes the Power Pressure Cooker XL. If you’ve recently purchased or received a Power Quick Pot as a gift, here’s what you need to know to get started! 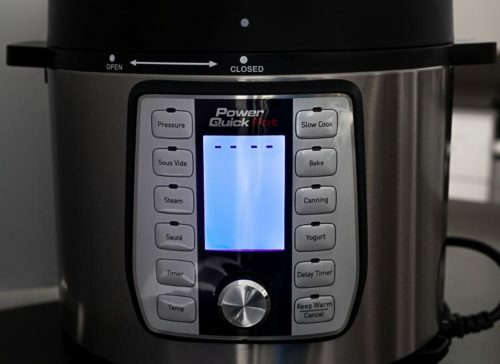 In design, the Power Quick Pot takes cues from the higher-end Instant Pot Ultra, with a spinning dial and multiple preset options. 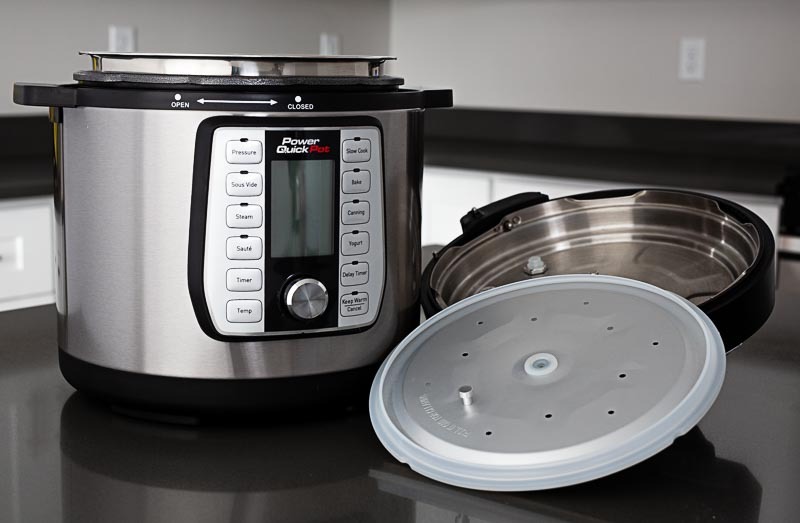 It has a thick, stainless steel pot, which is a big upgrade from the Power Pressure Cooker XL. Another upgrade from the Power Pressure Cooker XL is the dedicated saute setting and the ability to customize the time and temperature in this setting. You can cook delicate sauces as low as 95°F and you can sear meats as high as 360°F. The Power Quick Pot is available in 4-quart, 6-quart, 8-quart, and 10-quart sizes. This is nice if you’re cooking for two or for a crowd; however, keep in mind that most pressure cooker recipes are written for the 6-quart size. If you are using one of the larger sizes, you’ll need to use more liquid in your recipes. This pressure cooker also uses different color lighting to indicate where it is at in the pressure cooking process; blue indicates standby mode, where you put in your desired settings; orange indicates preheating mode; red indicates fully heated. We love that the Saute feature displays the temperature on the screen once the pot has reached the desired temperature, so there’s no guessing or listening for beeps to indicate when the pot is hot. The Low, Medium, and High settings are NOT pressure levels. 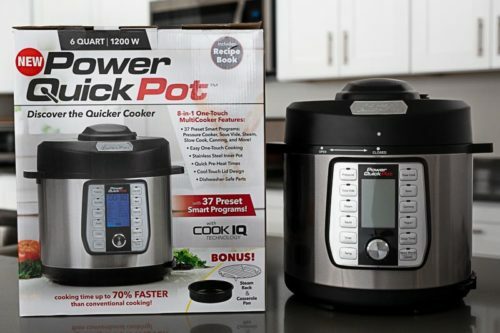 The Power Quick Pot does not actually cook at different pressure levels, like the Instant Pot can. The Power Quick Pot ONLY cooks at high pressure. (If you want to get technical, the Power Quick Pot cooks between 11.6 to 13 psi; the Instant Pot Duo has a slightly lower range, from 10.2 to 11.6 psi.). Instead, the Low, Medium, and High settings are preset time settings. The Inner Lid gaskets have a very different construction than brands like the Instant Pot, and they’re a bit more finicky to put together. Be sure to attach the inner lid to the outer lid with the knob facing out and the writing visible. 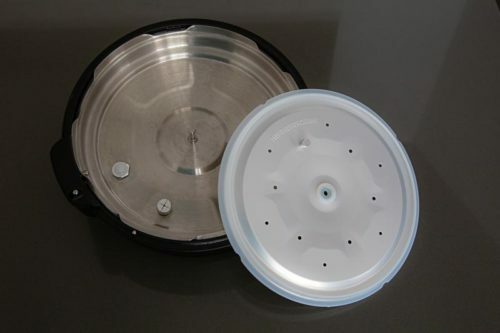 If the inner lid is installed inside out, it can prevent your pot from coming to pressure. You also have to keep track of the tiny Float Valve Pin so you can place the rubber gaskets on the float valve. The cord is on the shorter side. It’s only about 36 inches long, so you have to be close to an outlet to use it. (It’s 8 inches shorter than the Instant Pot cord.) As a reminder, you can’t use an extension cord with the Power Quick Pot or any other brand of electric pressure cooker. The first several times we pressure cooked in the Power Quick Pot, there was a strong plastic smell when releasing the pressure. (We checked for plastic around the housing, stickers, anything that seemed out of place, but we couldn’t find anything.) Luckily, the smell didn’t transfer to our food, but it’s something to be aware of. The smell lessened over time. If you’re upgrading from another brand of pressure cooker, keep in mind that the lid turns the opposite way from the Instant Pot and many other brands. Just match up the dots on the lid with the dots on the housing. Press the dial to select the Custom option, then spin the dial to Low (10 minute default), Medium (30 minute default), or High (60 minute default). Adjust the cook time by pressing the Timer button and spinning the dial until you reach the desired time, then press the dial to select it. Your Power Quick Pot display should turn orange to indicate that it’s preheating and building pressure. 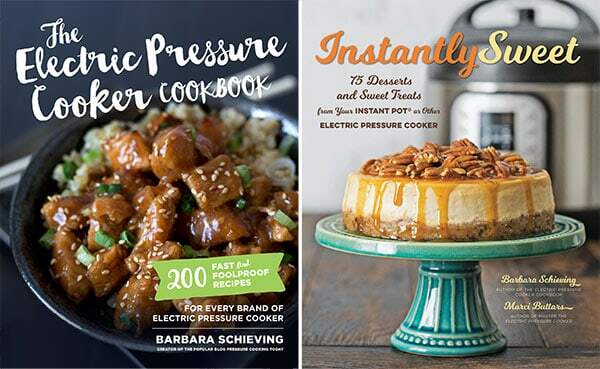 Any recipe that cooks at high pressure will work in your Power Quick Pot—regardless of whether the recipe was developed for the Instant Pot, Ninja Foodi, or any other brand of electric pressure cooker. What do the buttons do on the Power Quick Pot? Press this button to cook your food at High Pressure. 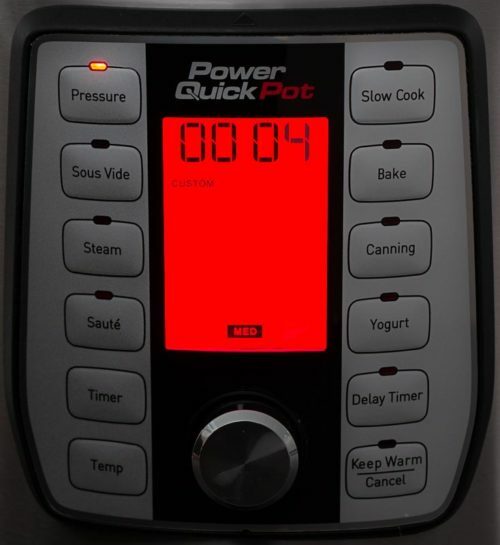 While the Power Quick Pot offers 14 different pressure settings that you can select, the ONLY thing you’re selecting is the default cook time. Your pot doesn’t know whether you actually have beef, beans, or barley in your pot. Instead, it just runs a preprogrammed cook time for the item you’ve selected. It also doesn’t know how much of a single ingredient you have in your pot. Regardless of whether you have a single chicken breast or a whole chicken in your pot, it just runs the preprogrammed cook time. 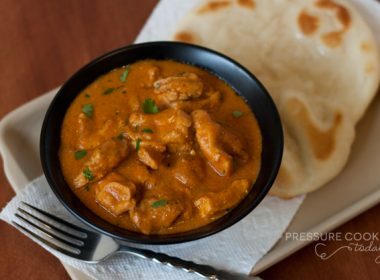 Whenever you’re cooking in your pressure cooker, be sure to use an instant read thermometer to make sure your meat is cooked to a safe internal temperature. Sous Vide is a method of cooking food inside a sealed plastic bag in a water bath. This cooking method is discussed on pages 20 and 21 of your manual. You can use the Timer and Temp buttons to set a custom temperature and cooking time for foods you’re cooking. Again, your pot doesn’t actually know what or how many ingredients you have in the pot; it just runs a program to cook for a certain amount of time. The Saute button allows you to brown meats and simmer sauces. Do not use the pressure cooking lid or the glass lid when using this function. The customization of the Saute setting is one of our favorite features on the Power Quick Pot. The default temperature for all of the Saute settings is 340°F. You can use the Temp button reach up to 360°F or down to 95°F. The Timer button is a little misleadingly named. It is NOT an actual timer function—that’s why it doesn’t have a little indicator light above it. Rather, this button allows you to adjust the timing in all of the other preset buttons. In order to adjust the time, you hit the Timer button, then spin the dial up or down to adjust to your desired time. Similarly, the Temperature button does not adjust the pressure cooking temperature. However, you can use it with the Sous Vide, Saute, and Slow cook features. I find it most useful with the Saute feature, where it allows you to adjust the temperature from 95°F to 360°F. You can also use the temperature button to change the temperature in the middle of the cooking program. Use the glass lid when using the Slow Cook setting. 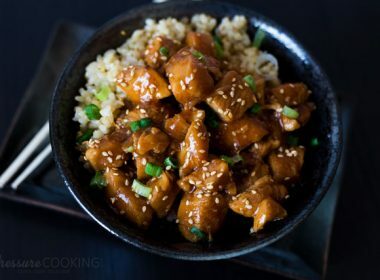 Generally on a Crock Pot, the low setting takes 7 to 8 hours to reach a simmer point of 209F, while the high setting takes 3 to 4 hours to reach the same temperature. According to the user manual, the slow cook setting can adjust the temperature between 195 and 212F. 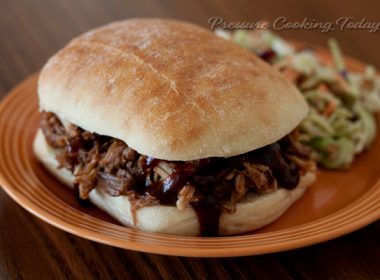 However, other people get great results using the slow cook setting on their pressure cooker. 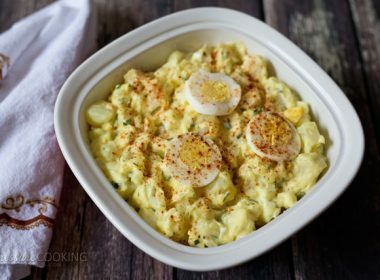 Find out what works best for your favorite recipes! Despite its name, the Bake button doesn’t actually bake like an oven—rather, it cooks the food at high pressure. I like to think of “Bake” as the cheesecake button—the medium preset time is exactly what I use to make my Caramel Pecan Pressure Cooker Cheesecake. This button runs the Power Quick Pot’s Canning function, discussed in pages 28 to 32 of the user manual. See the canning discussion below. Use the glass lid with the Yogurt setting. Page 22 of the Power Quick Pot manual has a very basic yogurt recipe that tells you “once the milk reaches 110°F, the Power Quick Pot will beep.” However, the pot doesn’t have a temperature sensor to tell you the actual temperature of the milk—it’s just programmed to estimate the temperature after a certain time. For best results, you’ll want to check your milk with an instant-read thermometer. Also, many people are surprised that homemade yogurt requires a small amount of store-bought yogurt or a yogurt starter to get the incubation process started. Learn more in my favorite Instant Pot Yogurt recipe, which works great in the Power Quick Pot. The Delay Timer is a common feature on higher-end pressure cookers. It is also not a traditional timer; rather, it will set your pressure cooker to turn on after a specified amount of time. To use it, select the pressure cooking setting and time, then press the Delay Timer button and use the dial to select the time you want your pressure cooker to wait before starting the cooking process. This is a feature you need to use with caution. For example, rice or oats will absorb water during the delay time, so you may need to add extra water to your recipe. For these items, I like to cook pot-in-pot to guarantee that the pressure cooker will be able to come to pressure. Also, please note that the user manual recommends to keep your delay time under 2 hours, especially when cooking with meats. I prefer to keep the delay time far under that, since 2 hours is the maximum amount of time the USDA recommends leaving food at room temperature. But it can be useful for dump and go meals while you are working on a few projects around the house. Once the high pressure cycle is complete, much like other electric pressure cookers, the Quick Pot automatically goes into Keep Warm. The Keep Warm mode will keep food warm for up to 24 hours, though you’ll want to keep in mind that food will continue to cook in the keep warm setting. (This is particularly important for rice, which will dry onto the bottom if left in the Keep Warm setting for too long.) In addition, foods will start to cool, so I wouldn’t recommend using it for long periods of time. I do like this feature when serving foods to a large crowd. I also like that using the count-up keep warm timer to track how long my food is at a natural pressure release. Is it safe to can foods in the Power Quick Pot pressure cooker? Do not use the canning button if you’re 2,000 feet above sea level. The lower the acid content in the food, the greater potential for contamination. Despite the instructions and pretty pictures in the user manual, the USDA still does not recommend pressure canning in the electric pressure cooker. So what are the USDA’s guidelines for canning with an electric pressure cooker? Even if there are instructions for pressure canning in the manufacturer’s directions, we do not support the use of the USDA canning processes in the electric, multi-cooker appliances now containing “canning” or “steam canning” buttons on their front panels. “No USDA thermal process work has been done with jars inside an electric pressure cooker, tracking the actual temperatures inside the jars throughout the process.” In other words, NO BRAND of electric pressure cooker, including the Power Quick Pot, has been proven to meet the temperature and pressure levels necessary to ensure the food canned inside is safe. 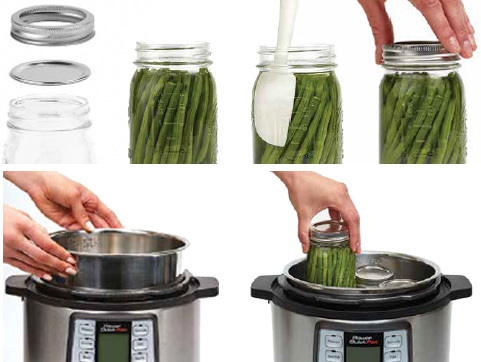 USDSA recommendations “were determined for stovetop pressure canners which hold four or more quart-size jars standing upright.” The jars recommended in the Power Quick Pot manual are pint-size jars, which would have different cooking requirements and have not been tested. “Bacteria are not killed in the food only during the process time; the time it takes the canner to come up to pressure, the process time, and the cool-down time all matter. There is no way at this point in time to know exactly the percentage of contribution from cooling for each of the canning recommendations. At this time, we DO NOT recommend pressure canning in the Power Quick Pot. However, you can do boiling water canning in your Power Quick Pot (and other brands of electric pressure cooker), as long as your mason jars are short enough to sit on the trivet and still allow an inch or two of boiling water to cover the jars. You can also make awesome freezer jams and compotes that will keep for up to a year in the freezer and 2 to 3 weeks in the refrigerator. If you’re up for experimenting with steam canning high-acid foods (think fruits, jams, and pickles), my friend Frieda has done some extensive testing with steam canning in the Instant Pot. Her instructions are easily adapted for the Power Quick Pot. What do the Power Quick Pot error codes mean? The Troubleshooting section on their user manual is found on page 27. There are five types of error codes you may see on your Power Quick Pot. I’ve never actually known someone to get an E1, E2, or E4 error; however, E3 and Lid errors are common. It indicates that food may be burned onto the bottom of the cooking pot. When you see this error, use a quick release to release any pressure in the pot. Open the lid and transfer the contents to a separate bowl. Then, check the bottom of your pot for any scorched or stuck food. Wait for your Power Quick Pot to cool down before trying to use again. 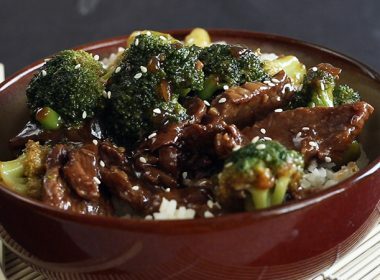 If food has burnt onto the bottom of your pot, you’ll need to use more water. Also avoid using ingredients containing thickeners, such as jarred tomato sauce. Do you have the Power Quick Pot? How do you like it? Let us know in the comments! I appreciate your in deprh analysis of the PQ Pot. Is it a multicooker like the Instant Pot, or is it a pressure cooker? I’ve used pressure cookers for decades and I thought it was time to consolidate my appliances into one multicooker. 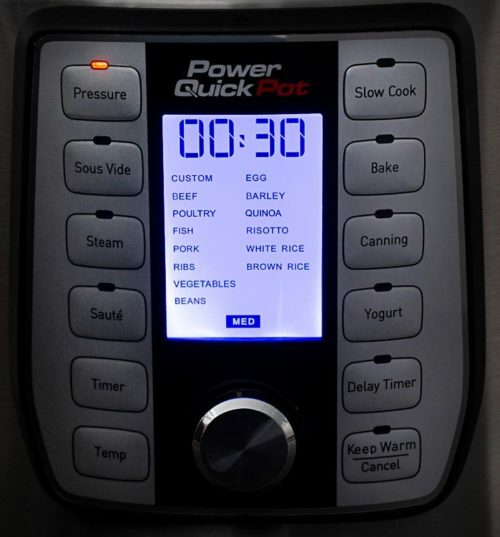 I’ve been trying to decide between the Instant Pot Ultra and the Power Quck Pot. Oh please help me. 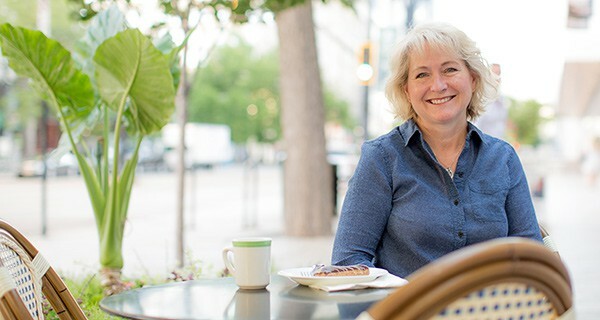 Hi Rhonda – yes, it is a multicooker like the Instant Pot. If the price isn’t a major consideration, I would go with the Ultra because the one piece lid is easier to clean than the two piece lid on the Power Quick Pot. Also, Instant Pot’s support has been better than Tristar. These cookers are sold without the accessories kit by some vendors, like WalMart and the Power Quick Pot web site. Wonderful article. It was shared on the 1st Power Quick Pot FB page and greatly appreciated. I don’t have this new Tristar brand pressure cooker. I did, however, buy the Tristar Power Pressure Cooker XL 2 years ago. It worked fine but the inside of the metal liner was nonstick with a honeycomb bottom. Within 4-5 months, that coating was flaking off into our food. I emailed the company and received a respond that basically said they would not do anything. Lucky, I bought it at Sam’s Club and they took it back. I didn’t notice or may have missed what type of liner this new model has. . It says it has stainless steel inner pot. I have the one you took back to Sames,I have bought several “extra” inner pots & they all have the same problem. In a way I think they did that on purpose so they could sell more inner pots, but that’s not how they should do business!! #1 The peeling off into our food is a health hazard!#2 It ticks me off, so I dont recommend that brand to anyone looking for a pressure cooker. Hope this helps you!